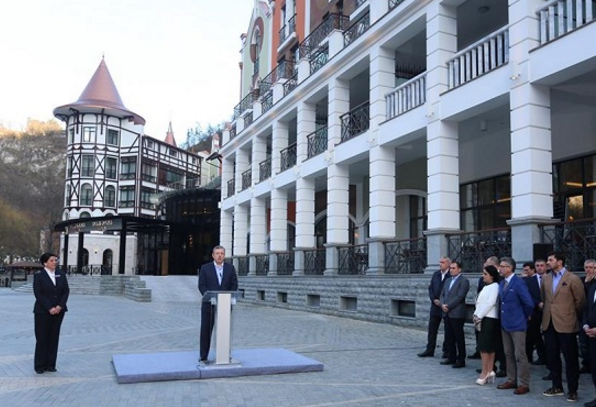 "This five-star hotel highlights the importance of Borjomi as one of the best tourist destinations in Georgia,” the Prime Minister said. Kvirikashvili, mentioning the recent increase in the number of visitors to the country, said: "Last year, despite the not so good economic situation around Georgia, we had an almost 10 percent increase of visitors”. Mtkheta-Larsi highway in eastern Georgian linking Georgia and Russia. Kvirikashvili said all of these projects would be finished by 2020. While in Samtske-Javakheti, Kvirikashvili also assessed the World Bank project that intended to pave a road to a medieval Georgian monastery. The program, co-financed by the Georgian Government, would see a 7.2km road section to Sapara Monastery be paved for the first time in the church’s history. "Construction of the road to Sapara Monastery is very important in many ways. The 7km section of road will be opened later this year. This place is visited by tourists, pilgrims, residents of the region and construction of relevant infrastructure around the road is crucial to all of them,” the Prime Minister said. Kvirikashvili also visited farmers and entrepreneurs living in Akhaltsikhe town and nearby villages who launched their businesses thanks to Governmental support projects such as Produce in Georgia, Small Enterprise Promotion Program and eco credit.